“No one does cheese curds likes Ellsworth,” says Mary Erickson, Associate Editor of Wisconsin Energy Cooperative News. 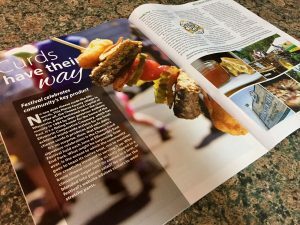 Mary recently connected with our Russ Korpela to talk about all that’s new with this year’s Cheese Curd Festival. This year’s event takes place June 23 and 24, 2017 in Ellsworth’s East End Park. From the event’s early days as a community festival, to its transition to foodie fest and music celebration, Mary did a great job telling our festival’s story. Wisconsin Energy Cooperative News even featured our event’s starring food on the cover! These beauties, along with several other creative cheese curd dishes, will be served up during this year’s festival. If you haven’t already, you’ll want to get familiar with our festival vendors here. No one does cheese curds like Ellsworth. This Pierce County village is, after all, the Cheese Curd Capital of Wisconsin, a title bestowed upon the community in 1984 by then Governor Anthony Earl. It’s a fitting honor for the home of the Ellsworth Cooperative Creamery, which has achieved worldwide acclaim for the fresh cheese curds it produces and sells daily.